IN THE early 1970s, a group of Japanese animators worked hard preparing an anime series about Pippi Longstocking. 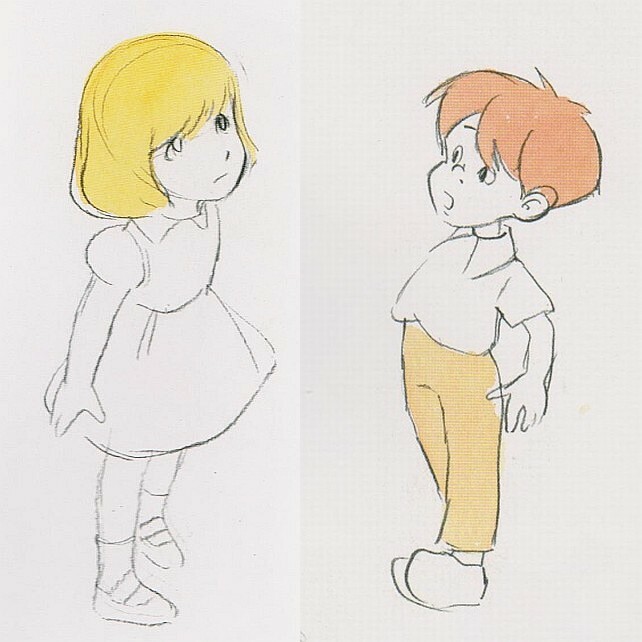 However, Astrid Lindgren never gave her permission for the project of Isao Takahata, Hayao Miyazaki and Yoichi Kotabe. Many years before the establishment of Studio Ghibli, in 1971, Hayao Miyazaki, Isao Takahata, and Yoichi Kotabe left Toei Animation and joined Daikichiro Kusube’s new company called A Production. They were supposed to make an anime series based on Astrid Lindgren’s (1907-2002) books about Pippi Longstocking. Pippi was well known in Japan. Lindgren’s first Pippi-books from 1945-1948 were translated into Japanese in the 1960s. Many Japanese had read 長くつ下のピッピ (Nagakutsushita no Pippi, Pippi Longstocking), ピッピ 船に乗る (Pippi fune ni noru, Pippi Goes on Board) and ピッピ 南の島へ (Pippi minami no shima he, Pippi in the South Seas). 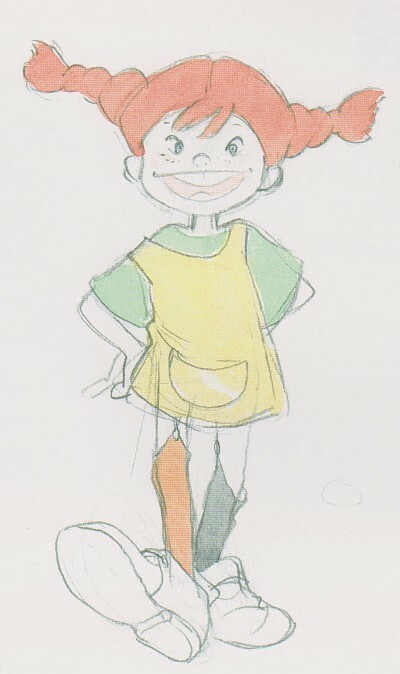 The TV-anime was called 長靴下のピッピ 世界一強い女の子 (Nagakutsushita no Pippi: sekai-ichi tsuyoi onna no ko, ”Pippi Longstocking, the strongest girl in the world”). Takahata was supposed to direct the series. Miyazaki made the storyboard, and Kotabe designed characters. The anime never materialized, as A Production failed to reach an agreement on intellectual property rights with Lindgren. The reason is not really known, but possibly the writer thought that the Japanese production would diverge too far from the original works. The future animation masters moved on to other projects. Pippi and Mr Nilsson enjoy Swedish sandwiches in the garden. MUCH material made in the preparation of the project has fortunately been saved for posterity. Now, four decades later the material is presented in a book published by Iwanami shoten: 幻の長靴下のピッピ (Maboroshi no Nagakutsushita no Pippi). The title could be translated to something like ”The Pippi Longstocking that Never Happened”. The book contains hundreds of pictures; character designs and storyboard images from the series. In addition, it has interviews and manuscript texts. Sadly, I understood only parts of the texts with my poor Japanese. An agreement about the book was reached with Lindgren’s heirs at the same time as an agreement about Goro Miyazaki directing the anime Ronia the Robber’s Daughter (山賊の娘ローニャ, Sanzoku no musume Ronya). Takahata, Kotabe and Hayao Miyazaki are named as the authors of the book. Obviously, an editor has also been involved, and an interviewer and an image editor. I LIKE the Pippi-plans made by the Japanese animators. They are carefully designed, and they have a lot of genuine Pippi-spirit. At best, Pippi reminds adults about how they have once been children themselves. The people in the anime designs look much like I imagined them in the books. Pippi herself, the neighbor’s children Tommy and Annika, the little monkey Mr Nilsson, the white horse Little Old Man, the two cops Kling and Klang… My own imaginings were affected much by Ingrid Vang Nyman’s (1916-1959) Illustrations in the Pippi-books. If the plans would have been realized, the anime would probably have been a lot better than the Swedish-Canadian animation from the 1990s. In that version directed by Clive A. Smith Pippi looks like a teenager, and the quality of the animation is just dull routine. The two policemen chase Pippi. Pippi is about ten years old, boisterous and somewhat mischievous, but always well-intentioned. She is also an eternal optimist. She manages her own life, she talks comfortably with her mother living in heaven, and she puts up nicely against the narrow-minded world of adults. I must admit that the storyboard has also some pictures which I cannot remember from the Pippi-books. Such as Gustav Gustavson’s castle surrounded by moats, and the magical deer met in the woods. However, my recollection may be incorrect, as I read the Pippi-books for more than 40 years ago. Pippi, Tommy and Annika on horseback. ”ROKEHAN” (ロケハン) is a word in wasei eigo, ”English” invented by the Japanese. It is abbreviated from the words ”location hunting”. A more appropriate English word is location scouting, which means the search for suitable shooting locations for a movie or a television series. In 1971, Takahata, Kotabe and Miyazaki made a rokehan trip to Stockholm and Gotland to find landscapes for the anime. Right away Miyazaki fell in love with Visby on Gotland. The medieval Hanseatic city reminded him of the fairly tales of Grimm and Andersen, and its buildings were quite suitable for Pippi’s home town. To my eye the the animators’ scetches look good. They could quite well be from Sweden decades ago, slightly transformed to look like a fairy tale. Villa Villekulla’s floor plan and interior pictures may be a little more Central European than what I imagined, but they are good. 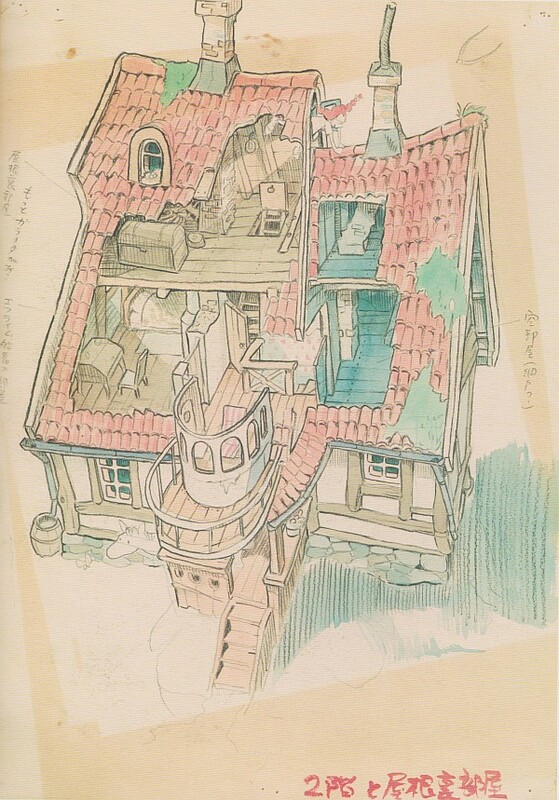 The diversity and maze-likeness of Pippi’s house remind me also of the Moomin’s house. THE ANIME plans for Pippi Longstocking were not altogether wasted. Parts of them can be found in subsequent works by Takahata, Miyazaki and Kotabe. 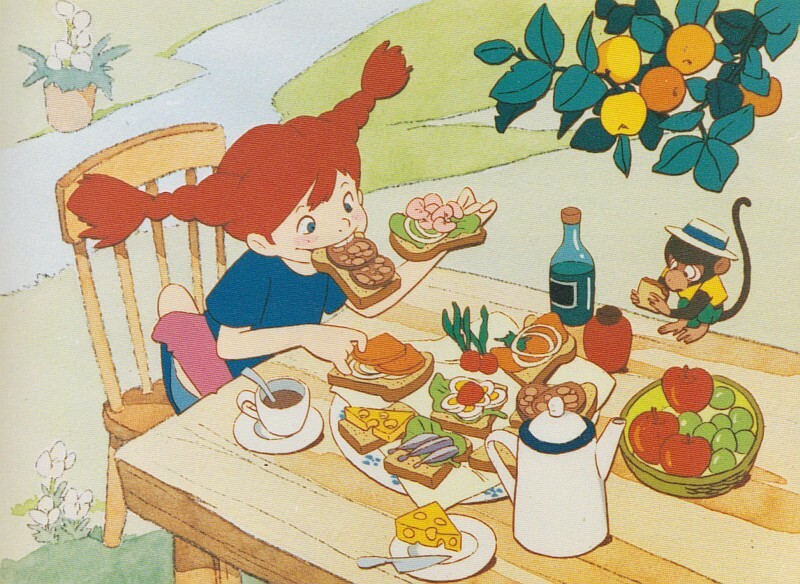 The red-haired figure of Pippi appeared already in 1972 almost unchanged in the short animation Panda kopanda (Panda! Go Panda!). 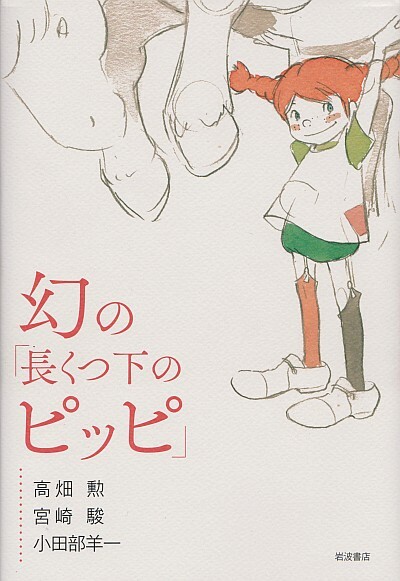 Its main character is a little girl named Mimiko, and she is the spitting image of Pippi Longstocking. Takahata directed the 33-minute film, and Miyazaki made the script. The following year, it got a sequel Panda kopanda: Amefuri saakasu no maki (The Rainy Day Circus). 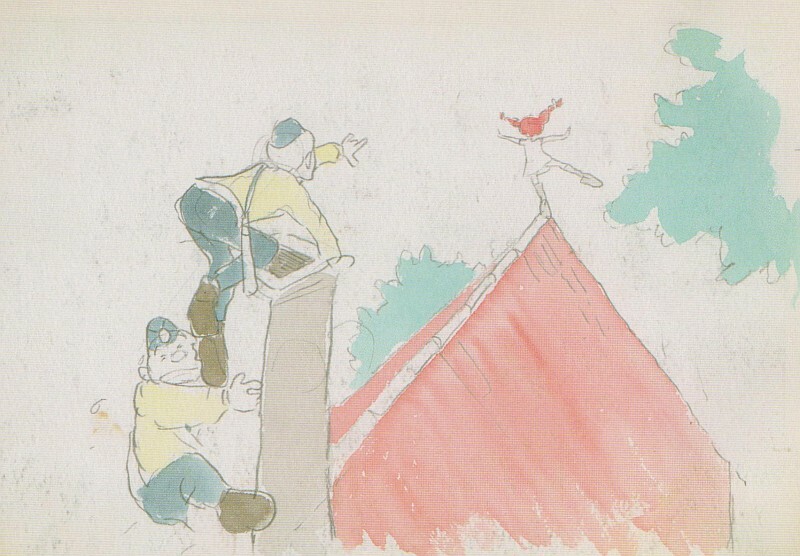 A scene in which Pippi was due to a swing high above the houses of Visby appeared slightly changed in the anime series Arupusu no shojo Haiji (Heidi, Girl of the Alps), based on Johanna Spyri’s book. The fifty episodes long TV-anime was broadcast in Japan in 1974. Kotabe made the character design, Takahata directed and Miyazaki drew up the storyboard. Landscapes from Visby and Stockholm appeared finally in Miyazaki’s film Majo no takkyûbin (Kiki’s Delivery Service) in 1989. 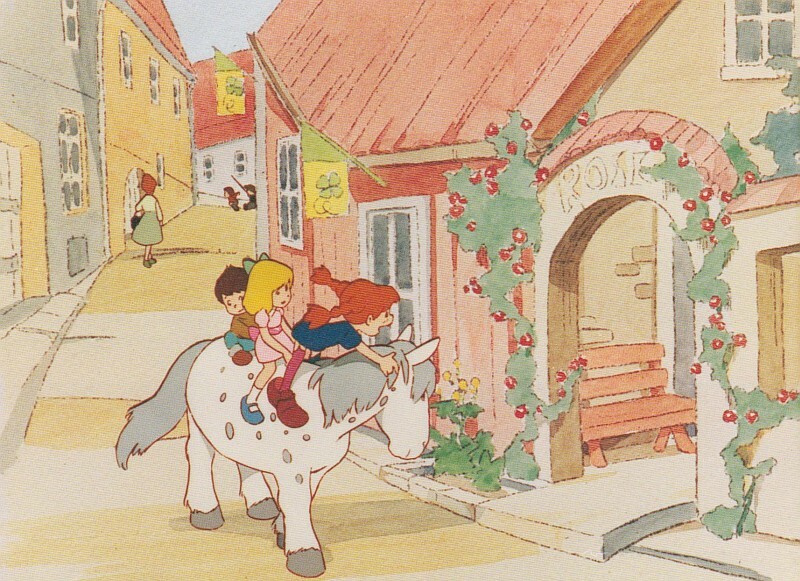 The results of the old rokehan trip for Pippi were the models for the seaside town Koriko, where the little witch girl Kiki flew on her broom to live on her own and grow up.